Previously Known as TehConnection, Anthelion is a new private Tracker Specifies in Movies only. 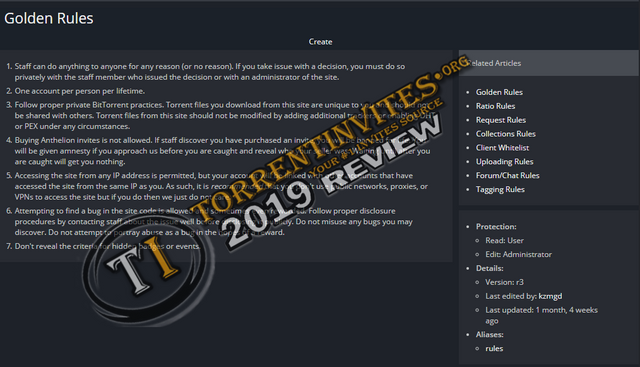 its a ratio base tracker with almost 1100 Enabled Users and 4600 Torrents. Maintaining Ratio can be difficult sometimes because of low amount of leechers. They got bonus system aswell. User can buy upload credit in exchange for earned bonus. community is not that active since its a new tracker and content wise Tracker does not have much to offer. Staff recently started competition for uploading rare old movies in reward for Bonus points to get the site growing. TheTrader, Chosen, darkbit11 and 6 others like this. Anthelion has movies like Ptp. You should add that Anthelion had/has no connections to the original TehConnection. Many people were confused thinking this tracker had risen from the ashes.. hence the name change. TheTrader and FreshWater like this.